Microcline is the characteristic feldspar of granite pegmatites, and may grow into tremendous crystals, several feet on an edge. Crystals may be blocky, or tabular and have a nearly rectangular or square cross-section with slightly slanted dome and pinacoid terminations. Twinning is common. Crystals can be twinned according to the Albite, Pericline, Carlsbad, Manebach and Baveno laws. Baveno and manebach twins are rare. The hardness and the cleavage are usually sufficient for identification, when considered in relation to the associated minerals. Distinguishing characteristics: Microcline is the only bright green feldspar. If of another hue it is distinguished from orthoclase by the pegmatitic occurrence. (Pegmatite orthoclase is almost unknown.) Distinguished from the markedly triclinic plagioclases by the lack of twin striations on the prominent cleavage face. The best green crystals have come from scattered pegmatitic pockets in schist near Crystal Peak and at Pikes Peak, Colorado, associated with smoky quartz. Good green crystals were found at Amelia, Virginia, in Brazil, India, Russia, and Madagascar. Ordinary microcline is found in almost every pegmatite. Microcline feldspars are used in the manufacture of glass, enamel and porcelain products. the Amazonite veriety makes a very nice ornamental stone and mineral specimens especially those with quartz are very popular. 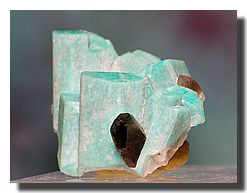 Amazonite was named for the Amazon river. Although it does occur in Brazil, amazonite has not been found in the vicinity of this great river. The name microcline comes from two Greek words meaning little and inclined, referring to the cleavage angle's slight inclination from ninety degrees. Feldspar is derived from the German word feld which means field. The astrological sign of amazonite is virgo. Amazonite is the birthstone for the month of December.